With Visa, you always pay in an easy and secure way - whether you buy in the store, on the Internet, by phone or by mail. Visa is the safest and easiest way to pay for cashless purchases anywhere in the world, 24 hours a day, 7 days a week. For this purpose, Visa offers various payment methods and several types of cards, perfectly adapted to your personal needs. Whether you prefer to buy on the Internet, pay by smartphone, quickly pay for contactless purchases or via your card's chip and PIN for maximum security, Visa offers a wide range of advanced technologies. The Visa Classic Credit Card allows you to make payments in 200 countries and regions around the world, access 38 million points of acceptance and withdraw money from 2 million ATMs. 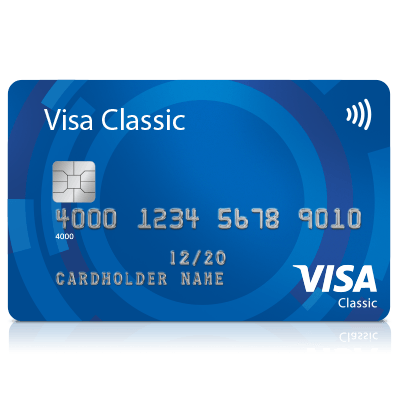 The Visa Classic card will often be granted to you without additional annual fee, when you open a current account. Contact your bank for specific terms and conditions. 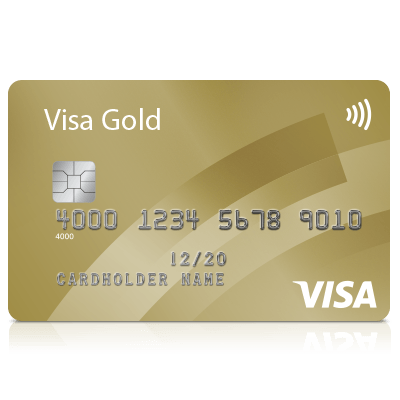 The Visa Gold card gives you even more freedom and flexibility for your daily expenses, thanks to a higher limit of use. The Visa Gold card also often includes additional services, including insurance covering your trips abroad, your luggage or legal protection on the Internet. You may also have discounts and preferential programs with some merchants. Contact your bank for specific terms and conditions. The Visa Platinum Card is for customers with above-average expenses. It offers many practical advantages, specially adapted to their needs. Frequent travelers may, for example, pay in foreign currency and at no charge when they are abroad. Depending on the card issuing bank, benefits may include certain bonus and discount programs or certain insurance benefits, such as "trip cancellation" or "legal protection", "liability" or "all-risk" renting a vehicle. 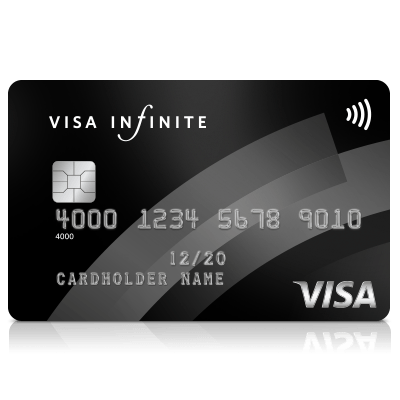 Visa Infinite is the most exclusive Visa card and can only be obtained by invitation. It includes important travel insurance covering the cardholder and his family, a personal concierge service available 24/7 and access to the airport lounge area as well as exclusive events and services, not to mention privileged access to many of the most prestigious hotels in the world, as part of the "Visa Luxury Hotel Collection". If you have a small or medium-sized business, the Visa Business card will allow you to separate your business and private expenses and lines of credit, while benefiting from an additional cash flow and various financing options for your business. The Visa Business card also guarantees cash withdrawals all over the world, always transparent accounts, the absence of transaction fees and a major simplification of your accounting and your administrative tasks. The Visa Corporate card allows large businesses to save money by reducing internal work procedures. Security and cost control are superior to cash transactions, reduce the need for interim financing, and your corporate design travels with your card. The other benefits of this Visa Corporate card depend on the issuing bank and may for example cover insurance benefits. The debit card is also often referred to as a payment card. It allows you to directly dispose of money on a checking account, including withdrawing money from ATMs or paying for your purchases in the store. The imputation on the current account is immediate or occurs after a few days. The debit card is therefore an alternative to cash payment from your current account. The card's billing allows you to keep track of your expenses at all times and keep them under control at all times. An amount paid using a defferred debit card will not be debited directly from your current account. The balance of your credit card accumulated for a whole month will only be deducted at the end of the month, in the form of a global amount. So you will be able to borrow some money, up to a pre-defined credit limit. Generally, no interest is due for this credit often limited to 4 weeks. Deferred debit cards are the most widely used form of credit card in Belgium. With credit cards with a partial payment feature, you can, if you wish, convert your monthly credit card bill to a payment in installments. Visa's partial payment feature also prepares you for short-term acquisitions - whether it's an emergency or an interesting opportunity that you do not want to miss. The Partial Payment Visa Card combines the simplicity and convenience of card payment with the benefits of flexible credit. You can then settle the amount due in a perfectly individualized manner, in several tranches. The Visa Prepaid card is a payment card based on the available balance. This means that before you can pay with your Visa Prepaid card, it has to be recharged. You will therefore be able to spend with the Visa Prepaid card only the money you have previously paid. This will keep you in complete control of your finances. When your balance is exhausted, simply reload the card. In principle, everyone can get a Visa Prepaid card, the minimum age limit being 12 years. Visa has designed the European chip and PIN code card called V PAY for European consumers. Thanks to V PAY, you can pay in any European business and withdraw cash at any ATM in the continent. 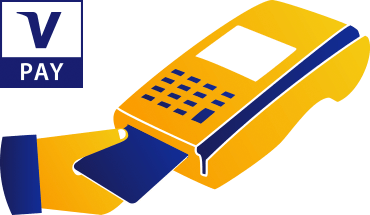 Since the V PAY card does not depend on the magnetic stripe but on the chip and PIN technology, it offers maximum security during payments. V PAY cards can be used by millions of merchants and thousands of ATMs across Europe.